Driven to extreme measures by the globe-spanning conspiracy known only as the People, Amanda Waller has done the unthinkable: made General Zod a full-fledged member of Task Force X! His first mission? Destroy the Annihilation Brigade, the People's own, much deadlier version of the Suicide Squad! Story - 5: I am absolutely loving what Rob Williams is doing with this book. Amanda Waller is one Evil Lady, but she is a necessary evil, and like any good villain, she believes she is justified in her works. I love the way she sets up Harcourt, before having her assassinated at Capt. Boomerang's hands. What goes around, comes around I guess, as that is exactly what Harcourt had Boomerang do for her, when she had hack killed. I'm also really curious to see how the guilt will continue to play on his mind, as we saw in last issue, he almost confessed to Harley what he did. Speaking of Harley, she's knocking boots with Flagg... I really hope that the Joker finds out, I would love to see that revelation go down. Williams is good at playing the slow game, So we may just get to see "Mr J" in future issues. Now on to General Zod, I always had reservations about him being in this book. He's the kind of villain that doesn't do too well being used excessively. In fact, that's my feeling toward all Kryptonians other than Superman. When you have multiple "Supermen and Superwomen" flying around, you diminish the importance and uniqueness of Superman. However, since Rebirth began, every Kryptonian on Earth has been used rather well. From Supergirl to Jon to Lana's Superwoman to even the Eradicator, every character has his or her own story arc, and don't ride Superman's coattails. 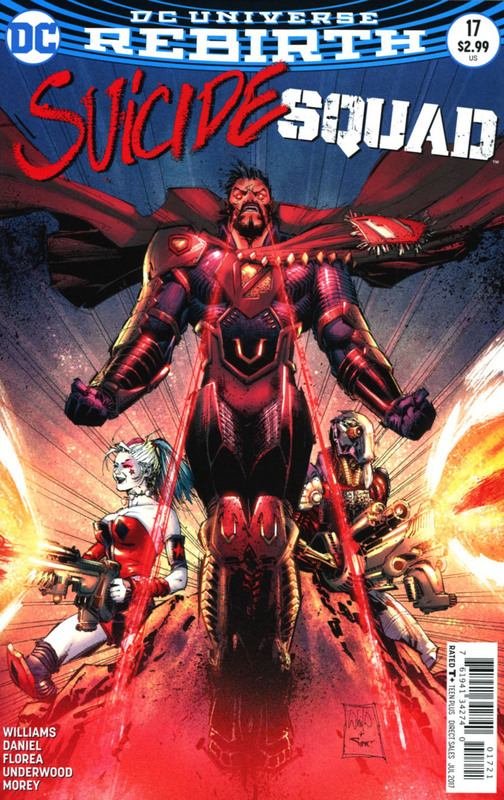 Having Zod be part of the Suicide Squad is a very original idea, one that Williams has made work well so far. This is the first issue we get to see him used fully, but it goes to show, what exactly it would be like, if a Government official had full control over Superman. Now we know that Zod will make his way over to Action Comics soon, as part of Dan Jurgen's Superman Revenge Squad story, but I really do hope that he returns to the Squad. The fact that he has been part of this book since issue #1, it would be a waste just to break him out and hand him over to Superman's rogues gallery. Also with Zod flying around, it is a sure bet that Superman will find out eventually, and come to shut the Squad down! This book has been a fantastic read so far, I urge you to pick up the trades and give them a look. This is one of the best books DC is producing this side of the Superman titles right now. Art - 5: Tony Daniel is a great fit for a title such as this. He has an awesome crisp line art style, and as I mentioned in last issues review, he can lay out a page and work every panel to the best of the story's requirement. The panel work forwards the story so well, you don't need the words to follow what is happening. With all that said, I love Daniel's rendition of Zod! He's crazy, strong, wild and strategic all in one. Daniel manages to capture all these facets easily throughout the issue. Zod is a natural leader, and even though Flagg is Squad leader, Zod takes centre stage. Very much like Wolverine in an X-Men comic. When he is on the page, your eyes gravitate toward that character. And Daniel manages to capture Zod's importance and stature in every panel. I absolutely loved the last page, as he fires his heat vision into his own head to remove the Kryptonite Nuero-Bomb, I love that psychotic look on his face. This page was reminiscent to the Alex Ross black and white short story featuring the Joker back in the late 90's. While saying that, there was a similar scene in the Superman: Doomsday animated film, where the clone Superman does the same thing. 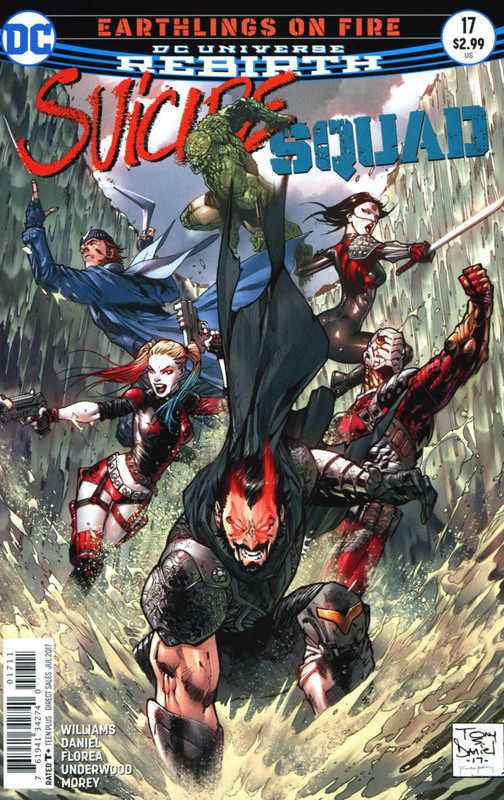 This is a Suicide Squad comic after all, so I do need to mention the rest of the Squad. Daniel really nails the Squad. He renders them all really well, especially Deadshot's costume and Killer Croc beastly form. I'm not too hot on either looks, but it's good to have an artist that can make them work, no matter how overdone I feel they are. Really can't wait to see who or even what else is in the Black Vault who Zod has promised to release. And as always, the colors bring the book to life. Cover Art - 5: "Superhero Landing" to quote Deadpool. I like this cover a lot. Zod is front and centre, looking menacing as ever. I like the composition very much. It's of course poster/pinup layout, but it works.